During one of our regular Mid-Missouri Circle mtgs. for cooperators of Opus Dei I showed them some of what you can do on an iPhone such as tweet a photo. 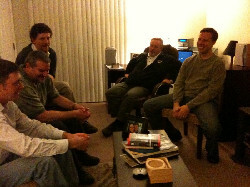 A circle meeting is a nice opportunity to get together for a scripture reading, mediation supplied by someone from the Wespine Study Center in St. Louis, examination of conscience and just to get caught up on the activities of each other and Opus Dei.